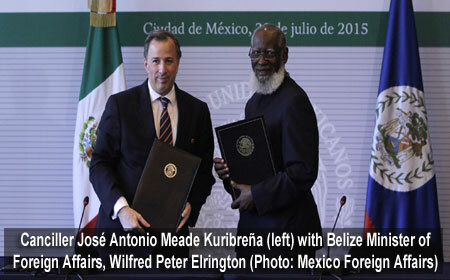 BELIZE CITY, Tues. July 21, 2015–During an official working visit to Mexico on Monday, July 20, 2015, Belize Foreign Affairs Minister, Attorney General Wilfred Elrington, signed 8 instruments of bilateral cooperation with his Mexican counterpart – Canciller José Antonio Meade Kuribreña, at the Ministry of Foreign Affairs in Mexico City. Elrington headed a delegation which also included Minister of Trade, Investment Promotion, Private Sector Development and Consumer Protection, Erwin Contreras; Minister of State in the Ministry of Education, Youth and Sports, Herman Longsworth; and Foreign Affairs CEO Lawrence Sylvester. The texts of the bilateral agreements, which Elrington and Meade signed, cover air transport, innocent passage by vessels to facilitate navigation via the territorial waters of the neighboring countries, energy cooperation, social security, intellectual property rights protection and the promotion of registered patents, climate change research, wildlife conservation, as well as consumer protection. The parties also discussed institutional cooperation to expedite the process of certification for livestock export. On the occasion of the visit, Elrington was bestowed with the Mexican Order of the Aztec Eagle, the highest order awarded to visitors to Mexico; while his Mexican counterpart was similarly decorated with the Order of Distinction of Belize. Minister Elrington also delivered a lecture on bilateral relations between Belize and Mexico at an event attended by over 250 students, academics, functionaries and members of the diplomatic corp.
Mexico’s Ministry of Foreign Affairs notes that that country is the chief trade partner of Belize in Latin America and the Caribbean. Mexico also provides electricity and natural gas to the country and is the third most important tourism market for Belize, next to the US and the EU. The ministry also notes that more than half-a-million passengers cross the border between the two countries, which significantly impact the economies of both countries.